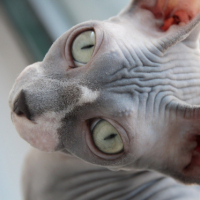 What do other people Mistaken your Sphynx for? Ha ha! Yes - I have heard "chihuahua and Devon rex"... And some people get me mixed up with Manx (that's no tail, not no hair, silly...oh well....). Best was: hairless RAT! Yikes! I\'ve heard everything from a rat to a skinny pug! I guess not all people can appreciate the cute kitties like we do! Ha! Love this thread. My experience: rat, mouse, or dog. One of my pictures of Tofu went a bit viral on tumblr with folks commenting on how he looks like Gary from Spongebob Squarepants because he was sitting with an arched back and his tail curled in a spiral. So... does a cartoon snail count?